Basic Information: What is GNC Hair, Skin & Nails Formula? This review will provide you a comprehensive survey of GNC Hair, Skin & Nails Formula. This product contains essential substances for the growth of our hair, nails and skin. Substances like biotin, lutein, and gelatin etc. make it very effective for your hair, nails and skin. Lutein: It keeps your skin hydrated and keeps it safe from the harmful antioxidants. Hydrolyzed gelatin: Gelatin is abundant in amino acids which are the building blocks of proteins. Therefore, it makes your nails strong and helps in the repair and growth of the tissue. Alpha lipoic acid: It is a potent antioxidant which provides protection from the free radicals. Free radicals are very harmful for our body and they are responsible for the early onset of the aging process. GNC Hair, Skin & Nails Formula does not contain artificial colors, artificial flavors, wheat, gluten, dairy or yeast. GNC Hair, Skin & Nails Formula should be taken daily, with or after the meal. The regular dosage is 2 capsules per day. Each bottle of GNC Hair, Skin & Nails Formula is available for $19.99. For the member, it is available at a discounted price of $14.99. Each bottle contains 60 capsules, which is a supply for a whole month. However, no subscriptions are offered by the manufacturers. I have been taking this product for about 2 months. I noticed my nails are stronger and thicker. As for the hair, hair fall has decreased a lot and it is definitely longer. Moreover, it is amazing because I don’t really break out anymore. The taste is not bad as well. Though the capsules are a bit bigger and might a challenge to swallow for some. GNC Hair, Skin & Nails Formula has helped me and I hope it helps you too. It contains soybeans and fish, so if you are allergic to them you cannot use this product. Moreover, if you are pregnant, nursing, under 18 years of age, taking medication or have a medical condition, then you should consult your physician prior to using this product. Stop using it two weeks before surgery. After thorough research we were unable to find any warranty provided by the manufacturers of GNC Hair, Skin & Nails Formula. The reviews by customers are mostly positive and show customer satisfaction. However, there are a couple of negative reviews but they are mostly from people who suffered from an allergic reaction caused by either soybeans or the fish extracts, which are present in the product. 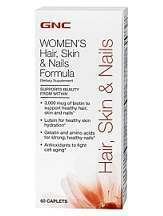 GNC Hair, Skin & Nails Formula is available in the form of capsules which can be swallowed easily. Customer reviews also establish the efficacy of this product. Nonetheless, the presence of soybeans and fish in it, make it unsuitable for people allergic to them. Also, no guarantee or subscriptions is offered by the manufacturers.